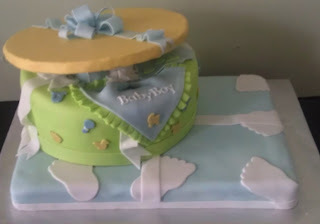 First up we have the baby shower cake I just delivered this past weekend to the Springettsbury Township Park in Springettsbury, PA. It a really nice park and lots open space, so if you are an outdoor person and have a shower coming up I would recommend that location. This cake really didn't have a theme, my client K saw a cake online and sent me the photo to replicate it. 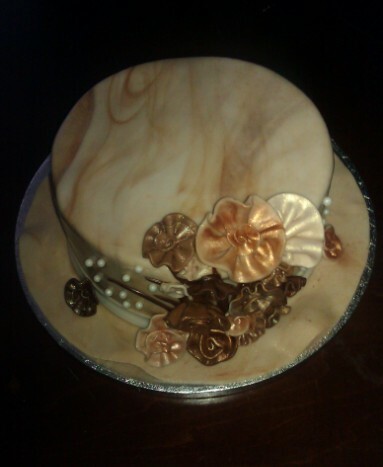 So you know how I feel about doing someone's else exact same cake so I put my whole little twist on it. The baby booties were different in that mind where hand made and not from a mold. I also made my gift box part of the cake a little different as well. The cake flavor was vanilla with vanilla buttercream. The next baby shower cake I did a couple of months but since my photos were bad (need to get a better camera) I never posted them. My client actually sent me some photos yesterday when her sister in law wanted to place an order for guess what?? A baby shower cake for her niece:) So here are the pictures she sent me. The cake was an 11x15 sheet cake with an 8 inch square on top. 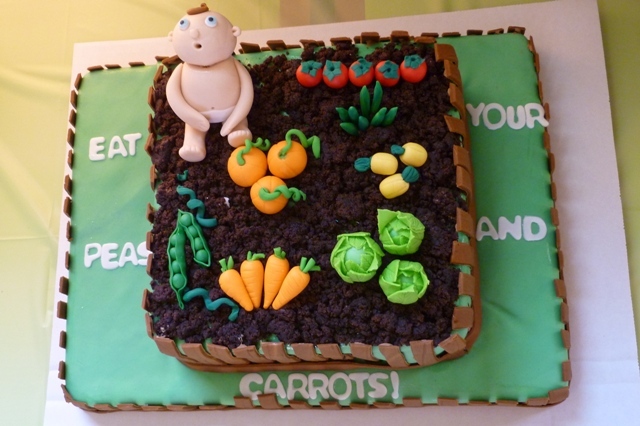 For the life of me I can't remember what the flavors were but the theme was "Eat your Peas & Carrots" so I made the 8 inch square look like a garden with a hand molded baby (my babies look so much better now than this one) and some hand molded vegetables. The "dirt" was crushed oreo cookies.The cake was delivered to Shank's Mare in Wrightsville, PA. It is a store located on the bank of the Susquehanna River that specializes in outdoor equipment rentals and tours of the area. They also have a meeting facility upstairs that they rent out for events like baby showers! 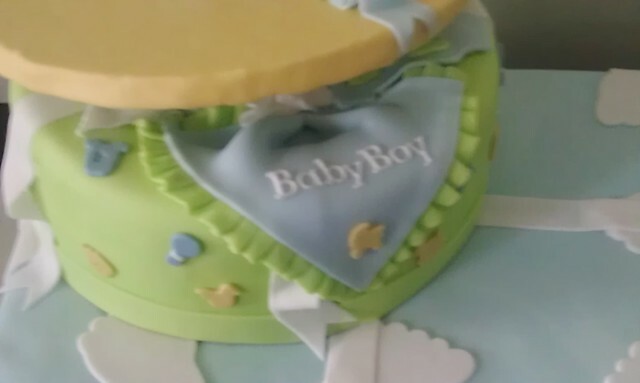 The last baby shower cake was for a client D, I did about 2 weeks ago and was delivered locally to a bed n breakfast here in York City. The name of the bed and breakfast is Grace Manor B & B on West Market Street in York, PA. The inn so is cozy and has all of the detailing and sophistication of an earlier era. 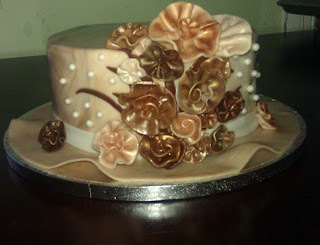 The cake in the shape of a lady's church hat in various shades of brown and beige with ruffle flowers and sugar beads. 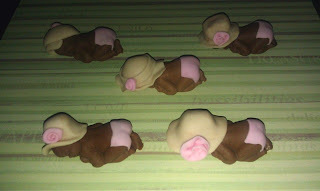 D also order cupcakes as well to go with the main cake which were decorated with little babies wearing hats. Soo I have officially slacked off again with my blog! Great thing is have been busy, bad thing my blog has suffered. So I am going to work backwards starting today to get caught up yet again. 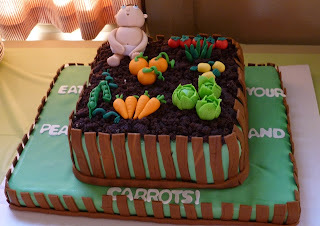 Since today is my husband's 30th birthday I decided to talk about his cake and go back from there. So I have a huge wedding and baby shower this weekend so I couldn't give my hubby another party like last year so I decided to keep it simple and make a cake and surprise him at his job. So I asked him what flavor and theme he wanted.. of course he said Amaretto (which has been his favorite flavor since he tried it) but he surprised me with the theme..Superman. I say, "Superman? Really??" and he says, "yes Superman!". So Superman it is.. I made a mini 2 tier cake (5 and 7 inch rounds) covered in blue fondant. The one thing I did differently was I made Swiss Meringue Buttercream for the first time.. and boy let me tell you..it is sooo freaking DELICIOUS!!! No lie! All family cakes will be made with this buttercream from now on and I will offer it to my clients now. It takes some work to make, but it is soo worth it. It has silky smooth texture and its not overly sweet..it just melts in your mouth. And I don't even like buttercream so that is saying something! 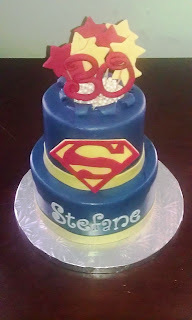 Back to the cake..so I made some stars, hand molded 30 and a the superman logo to on the cake. Nice and simple the way my hubby is:) He loved it so I am happy. Now off to make cookies, cake pops, and etc.. for this wedding.